Worth noting, however, is that even though our fair state has the most pedestrian fatalities, we don't have the highest percentage of pedestrian deaths; that dubious distinction goes to New Jersey, followed closely by New York (the full table also includes Washington, D.C. with 47 percent, but it's hardly reasonable to compare state statistics with city statistics, so we'll set that aside). 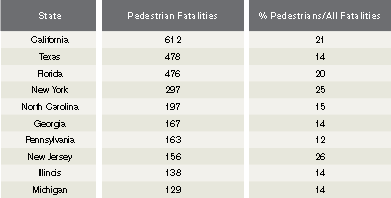 The real question is how these numbers compare with the number of people out there walking--we know that pedestrians are ove-represented when it comes to deaths/injuries, but are these percentages wildly disproportionate? Without good data on walking mode share, we can't really know--all the more reason to push for better pedestrian counts.